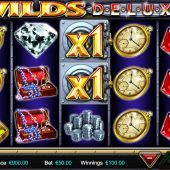 Wilds Deluxe is a slot game with 10 paylines in total over 5 reels of 3 rows. This Betdigital title has a jewels theme to it with the focus very much on the Wilds in this game. The bonus feature in Wilds Deluxe offers a chance to improve your winning possibilities with extra Wilds (of course). Wilds Deluxe has a Theoretical RTP (return to player) of 96.00% and this game is medium to high volatility. If you enjoy games packed with lots of Wilds then you should check out Stake Logic's Fruits Gone Wild or Wild Play Superbet from NextGen Gaming. Both of which are available to play online via mobile, tablet or PC.